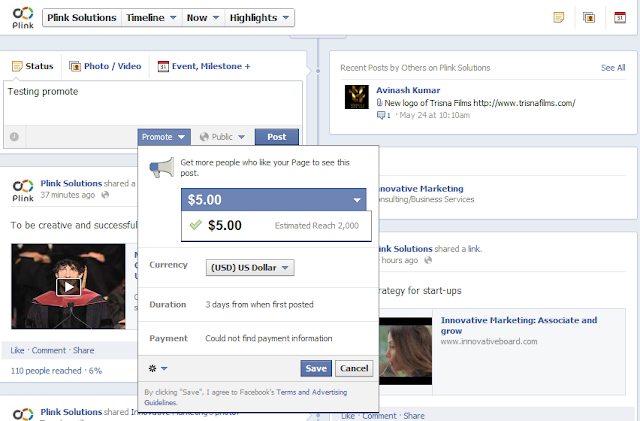 It was nice to see a Promote option for posts on my Facebook pages today. Afterall I am hardly able to reach around 10% percent of the Page followers through any post due to Facebook's Edgerank algorithm. It seems to not only take out those not interested but also those who are Listerners (and prefer to be so) and not engagers (who like, share and comment on posts). Facebook says that these Promote posts are "a simple way to reach more of the people who like your Page and their friends". But is this so or there is more to it? Is Facebook taking away Page's followers and then forcing Pages to pay Facebook to get them back? The Promote option opens an innovative opportunity for Facebook to increase its revenues from its current lot of customers without spending a penny. Earlier businesses were advertising on Facebook to promote their Page and get new followers. And why not. It opened up a new free media with a one time cost of acquisition. But then came Facebook's Edgerank started customising the followers feeds according to a weird algorithm (based on engagement) that chose what was important for them and what not. Ohh and most Pages seemed unimportant for most people. So now you have followers on your Facebook page but they arent reached by your posts. Another problem. Now Facebook has come out with a winner. Pay them to tweak the algorithm in your favour to ensure that the followers you bought of Facebook are allowed to really follow you. It seems like paying money to jump queues to get darshan (see the idol) of Lord Balaji in Tirupati shrine. Ofcourse the gatekeepers of the Lord, the trustees, welcome all. But how fast you get a darshan can be tweaked by paying for premium passes that allow you to enter shorter lines (resulting due to higher fees). But you know what, a few of my friends who went there last week told me that they ended up getting the darshan later than those who paid lower than them (more people are paying higher). This shows the next trouble for Page owners and a new opportunity for Facebook. When most posts are promoted how do Page owners still ensure Post views. Would Facebook use Google style reverse auctioning of feeds or would they ask users to pay a subscription fee for a clean feed like Tirupati temple charges for a darshan. What do you think might be the next few options that Facebook undertakes to pacify its deluded investors. Any other guesses. Share with us in the comments below. Now to know on how to promote your page post visit this official Facebook helpline.